A fantastic printer that is our top recommended machine for heavy use offices. With fast performance, excellent quality and cheap running costs, it ticks all of the boxes. Any office needing a printer with far larger consumables and usage than typical laser printers need look no further than this beast. Great print quality in a fast, easy to use machine. Literally the only thing it's missing is a scanner. It's so good we switched the Stinkyink warehouse printers to it and have not been disappointed. If you're desperate for wireless or NFC HP provide an accessory for their machines called the HP JetDriect 3000w wireless/nfc accessory, we've not tried it but it is a way to work around the printers limitation if you're not using AirPrint or Google Cloud print. If you're approaching the upper levels of usage for this printer we'd definitely advise purchasing an extra paper tray or three for it to expand on its 500 sheet initial tray. One of the very few downsides to the HP 556dn is the time it takes to print the first page. It's startup times are close to that of office lasers that need to warm up, with first pages taking up to 10 seconds to come out. If you frequently run single page prints in your office and speed is of importance that could be a deal breaker, but offices like that should really split their printing requirements into a smaller machine for day-to-day, leaving printers like the 556dn for the bulkier prints. And that really is where it excels, with speeds in excess of 60 pages per minute (ppm) on large simple documents. Adding in images and PDFs obviously lower the speed, but you're still looking at over 20ppm which is great. 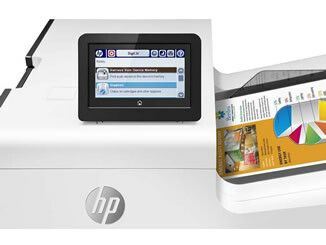 HP's patented PageWide technology has been surprising everyone with its quality and the 556dn is no different. Text is very accurate and crisp, with graphics and colour images like PowerPoint slides being produced very well. Photo prints are not that impressive, coming out slightly dulled, but this is an office machine with inks designed for volume, so this isn't surprising. A very important thing to note is the lack of borderless printing. PageWide machines cannot print to the edge of documents and always need to leave a small margin. This means if your office relies on handouts that fill the page the 556dn is not suitable for you. As is becoming common with printers aimed at larger volume users, the HP 556dn comes with three cartridge capacity choices across the four colours. 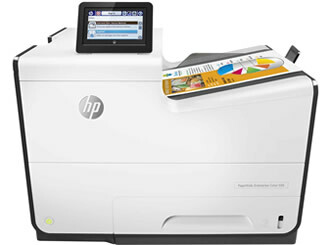 The lower capacity cartridges, the HP 981A range, give a yield of up to 6,000 pages across all four colours. 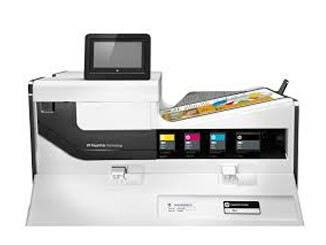 The high capacity HP 981X give you up to 10,000 pages in the three colours and up to 11,000 in the black. The extra high capacity, the HP 981Y range, go all out with a huge yield of up to 20,000 pages in the black and 16,000 pages in each of the three colours. The larger capacity cartridge you use, the lower your running costs, giving a wonderfully low 1p per page in the extra high capacity toners from the genuine HP version. This will eventually come down as third party options become available, but they're still fantastic value even before then. Even using a pack of the smallest capacity toners only increases your running costs to 1.5p per page for black and colour, making the 556dn a very competitive offering. If you're a busy office that needs a printer without the bells and whistles, the HP 556dn enterprise colour is made for you. Just make sure you print at least a thousand pages a month or the toner sizes will be wasted on you.